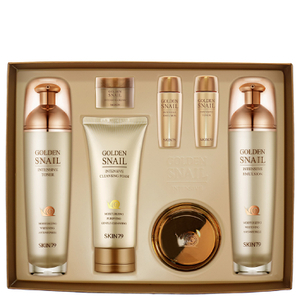 Transform dull and fatigued complexions with the Golden Snail Intensive Skin Care Set from Korean skincare brand Skin79. Utilising botanical extracts with the natural-wonder ingredient of Snail Secretion, the set leaves skin feeling cleansed, hydrated and nourished. Get glowing skin with the lightweight facial cleanser that sweeps away dirt and impurities for a refined and balanced complexion. Synergising the repairing properties of rare plant extracts and an advanced Golden Snail Multi Complex, skin feels moisturised and replenished with enhanced hydration levels and increased elastin production. Restore a youthful glow with the Intensive Toner. Fusing together the powers of Golden Snail and Bird Nest Extracts, the anti-ageing formula delivers intense moisture and hydration, whilst helping to minimise the appearance of wrinkles. Housed in a pump bottle for effortless application, you can expect a smooth, refined and rebalanced complexion that is prepared for the next step in your skincare regime. Rejuvenate the delicate eye area with the Intensive Eye Cream; a lightweight, regenerating formula that works to moisturise and hydrate. Fortified with a nourishing blend of rare ingredients, including Golden Snail and Bird Nest Extracts, the fast-absorbing cream helps to minimise the appearance of fine lines and wrinkles, whilst Niacinamide combats dark circles and dullness to reveal a smoother, brighter eye contour. Cleansing Foam: Apply proper amount and massage with ample foam over entire face. Toner: After cleansing, apply over entire face. Eye Cream: Apply gently around the eye area. Emulsion: After essence, gently apply over entire face. Cleansing Foam: Water, Glycerin, Stearic Acid, Myristic Acid, Lauric Acid, Potassium Hydroxide, Peg-32, Potassium Cocoate, Glyceryl Stearate, Peg-100 Stearate, Potassium Cocoyl Glycinate, Cocos Nucifera (Coconut) Oil, Panax Ginseng Root Extract, Swiftlet Nest Extract, Viscum Album (Mistletoe) Fruit Extract, Origanum Vulgare Leaf Extract, Salix Alba(Willow) Bark Extract, Chamaecyparis Obtusa Leaf Extract, Gold (Ci 77480), Portulaca Oleracea Extract, Scutellaria Baicalensis Root Extract, Lactobacillus/Soybean Ferment Extract, Cinnamomum Cassia Bark Extract, Dioscorea Japonica Root Extract, Polyquaternium-7, Peg-150 Distearate, Cocamidopropyl Betaine, Sodium Chondroitin Sulfate (497ppm), Polydecene, Butylene Glycol, Squalane, Dipropylene Glycol, Pentylene Glycol, Ethyl Hexanediol, 1, 2-Hexanediol, Ethylhexylglycerin, Disodium Edta, Sodium Benzoate, Phenoxyethanol, Fragrance (Parfum). Toner: Water, Snail Secretion Filtrate (300,00 Ppm)Glycerin, Niacinamide, Peg/Ppg-17/6 Copolymer, Pentylene Glycol, Saccharum Officinarum (Sugarcane) Extract, Chondrus Crispus Extract, Aloe Ferox Leaf Extract, Panax Ginseng Root Extract, Viscum Album (Mistletoe) Fruit Extract, Gold (Ci 77480), Swiftlet Nest Extract, Gardenia Tahitensis Flower Extract, Origanum Vulgare Leaf Extract, Salix Alba (Willow) Bark Extract, Chamaecyparis Obtusa Leaf Extract, Portulaca Oleracea Extract, Scutellaria Baicalensis Root Extract, Lactobacillus/Soybean Ferment Extract, Cinnamomum Cassia Bark Extract, Discorea Japonica Root Extract, Dipropylene Glycol, Peg-60 Hydrogenated Castor Oil, Tromethamine, Octyldodeceth-16, Sodium Chondroitin Sulfate (995ppm), Adenosine, Sodium Hyaluronate, Sodium Polyacrylate, Biosaccharide Gum-1, Polydecene, Butylene Glycol, Squalane, Ethyl Hexanediol, 1, 2-Hexanediol, Carbomer, Disodium Edta, Phenoxyethanol, Fragrance (Parfum). Eye Cream: Snail Secretion Filtrate (560,000ppm), Glycerin, Butylene Glycol, Dipropylene Glycol, Petrolatum, Diisostearyl Malate, Myristylmyristate, Cyclopentasiloxane, Niacinamide, Pentaerythrityl Tetraethylhexanoate, Cetearyl Alcohol, Ethlhexyl Palmitate, Cyclohexasiloxane, 1, 2-Hexanediol, Macadamia Integrifolia Seed Oil, Macadamia Ternifolia Seed Oil, Aloe Ferox Leaf Extract, Panax Ginseng Root Extract, Swiftlet Nest Extract, Viscum Album (Mistletoe) Fruit Extract, Gardenia Tahitensis Flower Extract, Gold (Ci 77480) (0.003mg), Disoscorea Japonica Root Extract, Origanum Vulgare Leaf Extract, Salix Alba (Willow) Bark Extract, Chamaecyparis Obtusa Leaf Extract, Portulaca Oleracea Extract, Scutellaria Baicalensis Root Extract, Lactobacillus/Soybean Ferment Extract, Cinnamomum Cassia Bark Extract, Behen Eth-20, Caprylic/Capric/-Myristic/Stearic Triglyceride, Hydroxyethyl Acrylate/Sodium Acryloyldimethyl Taurate Copolymer, Sorbitan Stearate, Sodium Chondroitin Sulfate (1,990ppm), Dimethicone Crosspolymer, Caprylyl Glycol, Acryl Ates/ C10-30 Alkyl Acrylate Crosspolymer, Tromethamine, Ethylhexyglycerin, Dipotasium Glycyrrhizate, Adenosine, Sodium Polyacrylate, Water, Polydecene, Ceramide 3, Phytosphingosine, Squalane, Pentylene Glycol, Ethyl Hexanediol, Disodium Edta, Phenoxyethanol, Fragrance (Parfum).